Every time I go camping, I learn something new. This trip was no different. 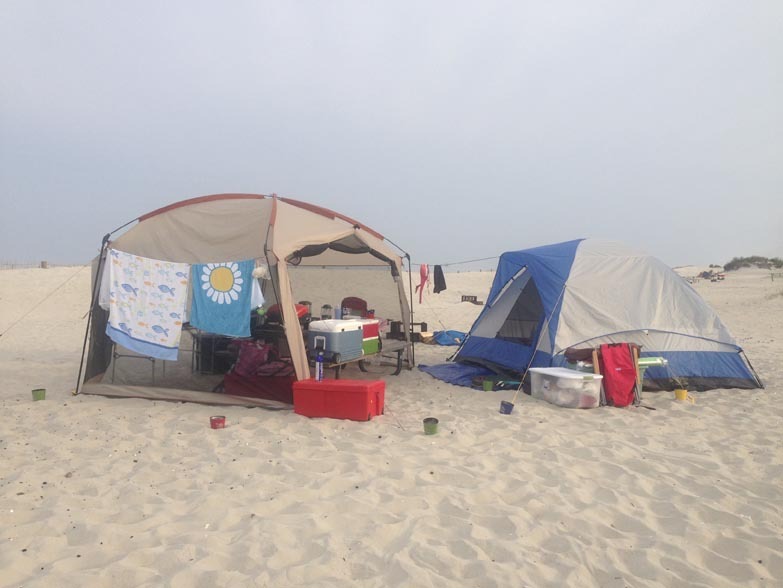 What I learned was: If you are planning to camp in Assateague, and the wind is coming from the west, change your plans. The biting black flies were torture not only to me, but the horses as well. 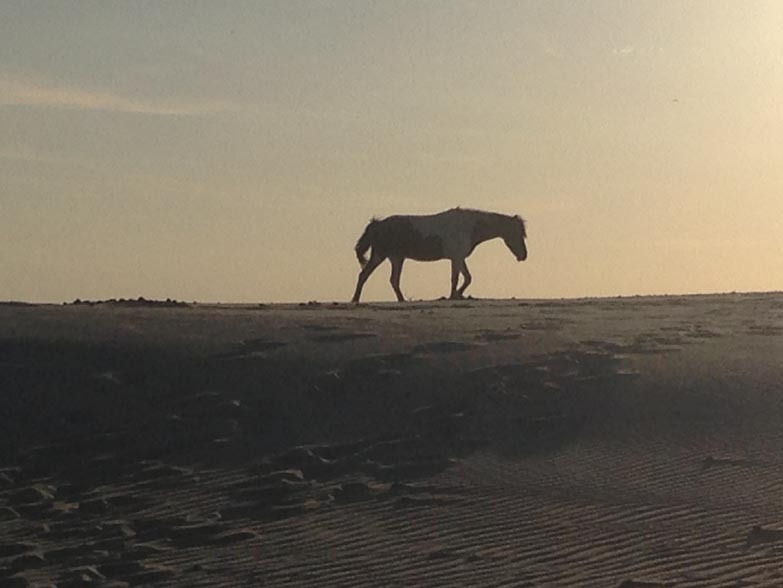 The wind coming from the west drives the biting flies towards the ocean, and the horses go to the beach to get some relief. For humans, no bug spray helps biting black or green flies. As for me, insects are just attracted to me. I will get bitten and bothered by insects when no one else is. 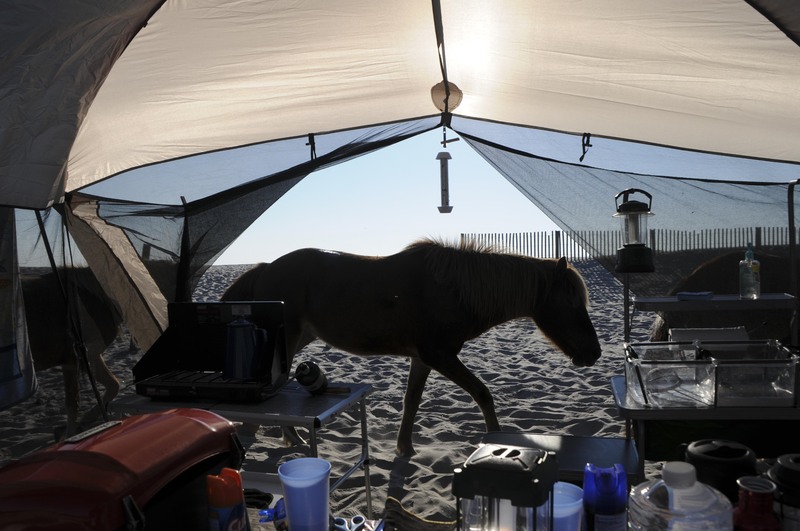 I have never camped at Assateague when the flies were so bad. There were hundreds of them landing on everything in my camp site. Even sitting on the beach near the ocean, the flies were still landing on me and biting my feet. My only relief from the flies was to cover up long sleeves, long pants and even socks (yes, even socks on the beach). You can see two horseflies approaching the horse. I know that long tail is used to keep them away. Here is a photo of my camp site all set up. 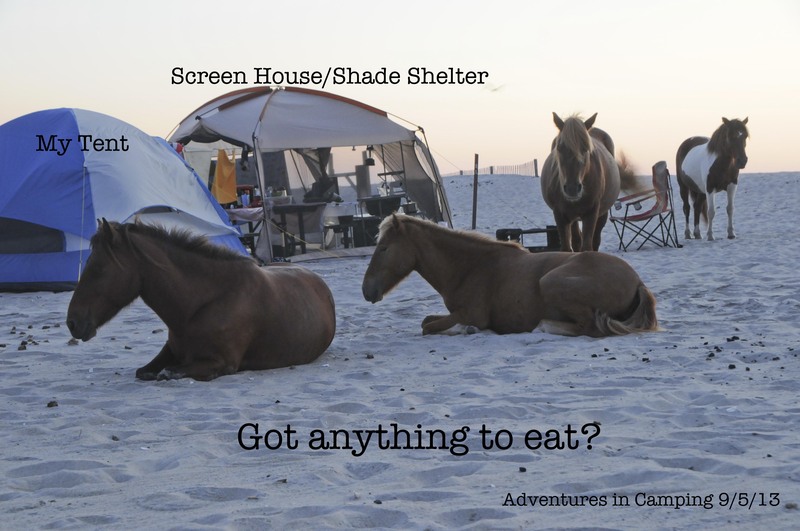 You need shade, and this time I put the shade tent over the picnic table which worked out really well. 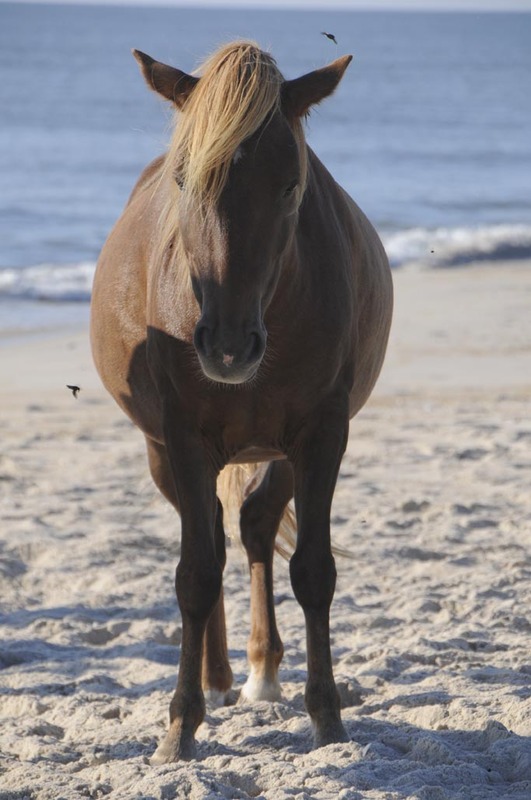 A requirement for camping in Assateague as guests of the horses, you must put all food into a hard sided cooler or plastic container. The people behind me neglected to do that one night, and…. after they ransacked that camp site and ate the food they left out, they came over to check out my site. The woman even attempted to grab something away from the horses until I reminded her that the horses are “wild” animals. 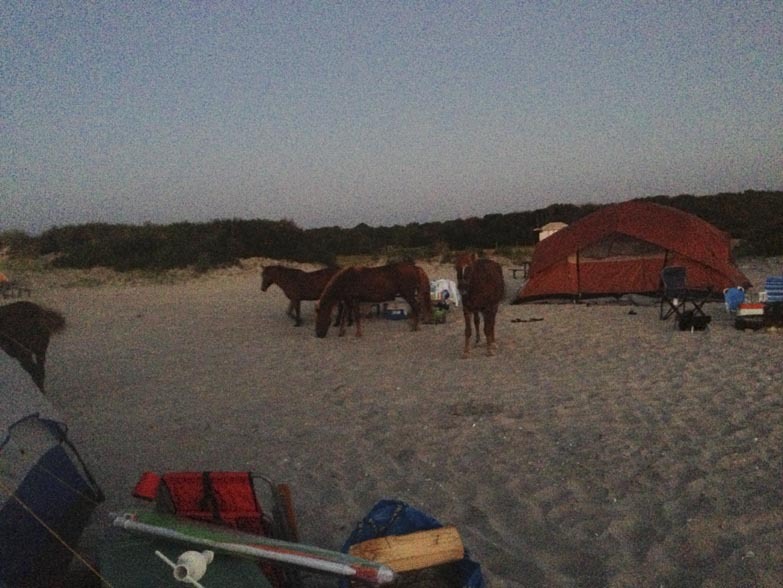 The horses decided to visit me for quite awhile hoping I would provide a nourishing yet satisfying breakfast. Of course, the absolute last thing I did (or anyone should do for that matter) was to feed the horses. Feeding them food meant for human consumption upsets their digestive systems and makes them dependent on people for their food source, which causes a lot of problems. I kept hoping for a change in the wind pattern from the west to anything BUT the west. My request was granted on Thursday evening, while I was enjoying my last camp fire. Very suddenly, out of nowhere, the dead calm of the evening was interrupted by wind blowing from the north east at 15 to 25 mph. The wind was blowing so hard it was rattling my tent, and I literally felt I was in the middle of one of the Poltergeist movies, and my tent was possessed by something evil. I took a video, and if I can ever get it to load, you will see, it was awful. I had no protection from the wind. I had to go and sleep in the car, and hope for the best. This is what I found in the morning. Both tents were still standing, except the one side of the shade shelter collapsed, however the guide lines were still firmly anchored in the sand with my 12″ stakes, thankyouverymuch. 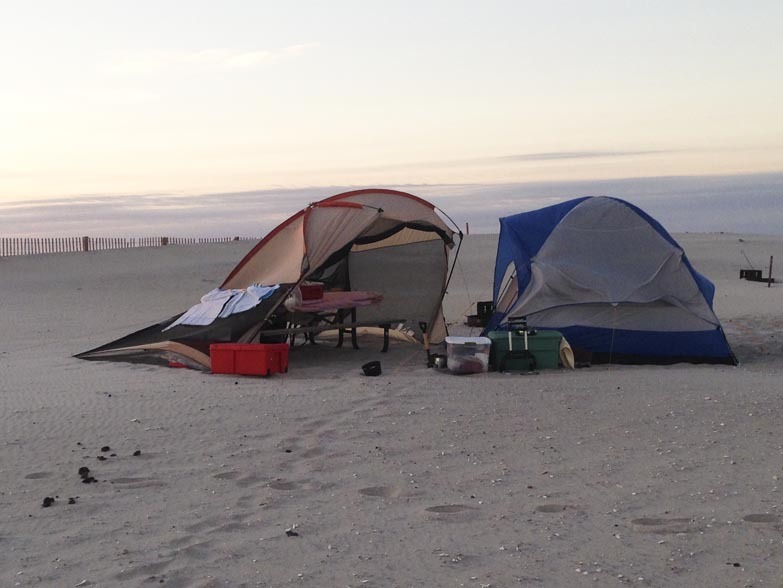 And I am SO proud my tent was still standing, after hours of howling wind. Then it was time to pack it all up and head for home. I am not camping here in the “hike-in, tent-only” area anymore, unless I pare WAY down what I bring. Otherwise, I am going to camp in my tent and have my car right there with all of the RV’s and those noisy generators. (Quiet hours are from 10 p.m. to 6 a.m.) And I can always sleep in the car again. It was SO quiet. The only thing missing was my air mattress.